Galicia is not only beautiful nature, it also has some great cities for a weekend getaway. These cities are small but packed with culture and history. Lugo – With about 100.000 inhabitants Lugo is not a large city, but it has its charm and the famous roman wall that surrounds the old town. This is the only city in the world that still has an intact roman wall still standing. The wall was built in the 3rd century and is a great place to go for a stroll! 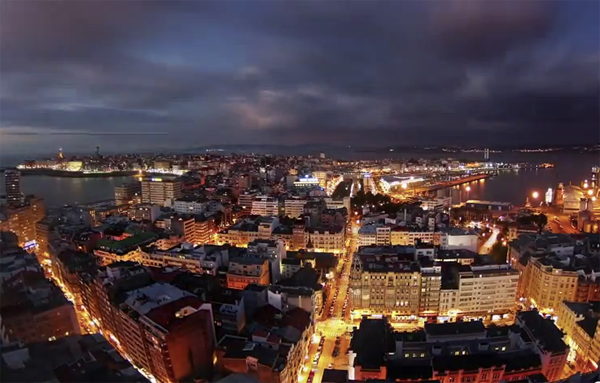 Vigo – With about 300.000 inhabitants Vigo is a coastal city, located just north of the Portuguese border. Vigo has among other things some very nice beaches, among them the Playa de Samil, a beach measuring about 1,7km in length. And with the The Cíes Islands not far away, this is a town very connected to the sea. Ourense – With a population of just over 100.000 inhabitants Ourense is the third larges city in Galicia. The city is located on the Miño river and the city can be traced back to roman times. One of the “must see places” is the outdoor public hot springs, As Burgas. La Coruña – La Coruña is the 2nd larges city in Galicia, located as far north and as far west as you can get on mainland Spain. The romans came to La Coruña in the 2nd century BC, and it is even said that Julius Caesar visited the town in 62 BC. In the 1st and 2nd century the Torre de Hercules was built, a light house that still stands today. Santiago de Compostela – With its 95.000 inhabitant Santiago de Compostela is the capital of Galicia, and most likely the most know city in this autonomous community. It is known for its pilgrims, the cathedral and the beautiful old town. The façade of the cathedral of Santiago de Compsotela can be found on the spanish euro coins (the 1 cent, 2 cent and 5 cent coins). The University of Santiago de Compostela was founded in the 16th century, and it is still very much a student town today.